1 Combine all ingredients except chicken in medium bowl; reserve 1/2 cup mayonnaise mixture. 2 Thread chicken on skewers*, then brush with remaining mayonnaise mixture. 3 Grill or broil chicken, turning once, 8 minutes or until chicken is thoroughly cooked. 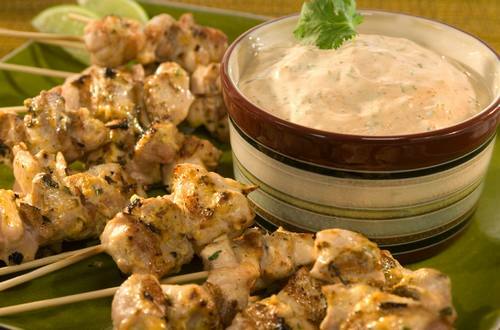 Serve chicken skewers with reserved mayonnaise mixture. *If using woodens skewers, soak in water at least 15 minutes prior to use. Cost per main-dish serving*: $0.95.